The MTV VMAs are always sure to give us a magical night filled with outrageous outfits, chart-topping performances, and maybe even a shocker or two. It’s really a tradition. Actually, it’s more of a requirement for one of the most talked about nights in music, and while the bold and the beautiful do what they do onstage — which is plentiful with wardrobe malfunctions and surprising acceptant speeches to keep us all guessing — the celebrities in the audience are free to hang out and snack on candy with their exes like it’s no big friggin’ deal. Isn't that right, J. Lo? 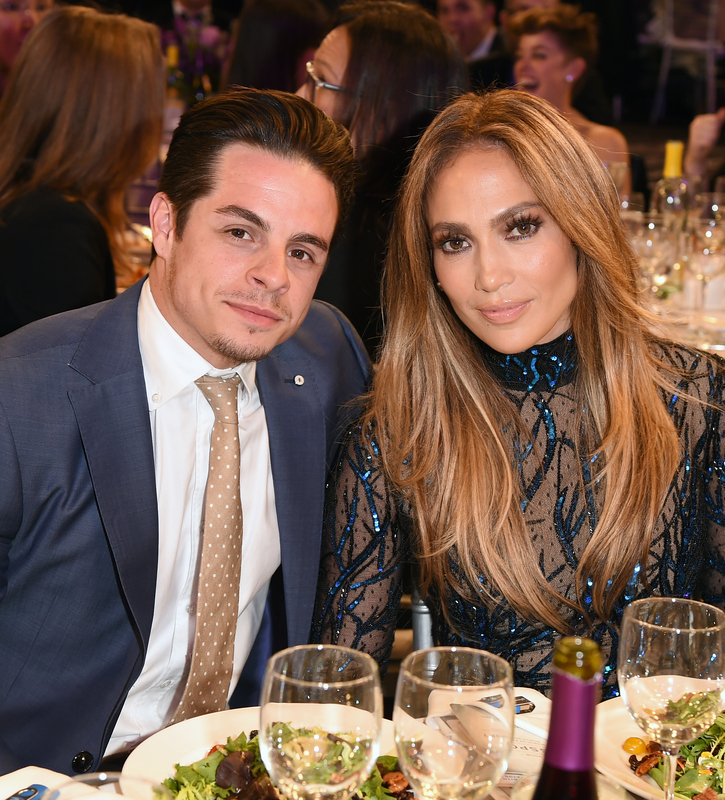 Jennifer Lopez shared Skittles with Casper Smart during the VMAs, and while it wasn’t the biggest draw-dropping moment of the night, but it was one of the most adorable ones. To be fair, the absolute most adorable moment honor obviously goes to Blue Ivy Carter who danced to her mom's music while sitting on papa Jay Z's lap. But, Smart and Lopez's Skittle exchange is firmly in second place. Smart recently told E! how he was still good friends with the "Booty" singer, but I didn’t actually believe him — celebs say that sort of thing all the time! It's nice to know that Smart was speaking the truth about his girlfriend for two years. The couple split in June after some infidelity rumors on Smart's part, but it goes to show that Jenny from the Block likely didn't believe any of it if she's still on Skittle sharing and speaking terms with the choreographer. They've also been seen driving around together in LA so they can clearly be in small spaces without arguing. Just don't get too excited and start expecting that J. Lo and Smart will get back together because while they're still chummy, Lopez has been looking super comfy with former Dancing with the Stars bad boy Maksim Chmerkovskiy. She obviously has a thing for dancers what with this rumored beau being her third choreographing love interest. (The other is her ex-husband Cris Judd.) Plus, Lopez told E! 's Chelsea Handler that she was single. That makes it official. So I guess, J. Lo is just one to leave on good terms with former flames. Sure, Lopez joked that in a hypothetical situation where she had a lifeboat and Ben Affleck or P. Diddy were floating in the ocean, she'd let them both drown, but she was kidding! In reality, Lopez has nothing but love for them both. However, if I were to guess, I would say that if Casper Smart were one of the choices, she'd at least save him first. He'd bring Skittles to share, after all.